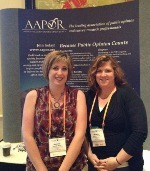 We recently had the opportunity to attend the 67th annual AAPOR Conference in sunny Orlando, Florida. Over 1,000 people in the public opinion research field attended. The theme of this year's conference was "Evaluating New Frontiers in Public Opinion and Social Research". The importance of incorporating cell phones into survey research projects is universally accepted among research firms following best practices. There are no longer any methods that can be used to “work around” the cell phone population. Ignoring that base of respondents will skew any project regardless of data analysis or sampling methods. Online surveys aren't just for computers anymore and need to be designed so that they can be viewed and completed on mobile devices using apps for smartphones and tablets in addition to web based programs. Social Media is still not a good avenue for conducting a representative survey of the general public because of the large scale bias that is found in the data. Though the research industry is seeking ways to harness the power of the large amounts of data available, there have not been any great breakthroughs in how to use this information to make key decisions in most markets. Though still an emerging technology, ‘gamification’ of surveys is gaining popularity in the field due to the improvement in user engagement and participation by applying psychological and sociological aspects of games and entertainment apps. This is a trend worth watching. On a lighter note, one of the more entertaining aspects of the conference was AAPOR's first ever video contest. There were five entries, and although this video was awarded third price at the conference, it was our favorite.